With Progresso Light and 100 Calorie Soups, you can enjoy a delicious cup of soup that provides great taste and variety all at 100 calories or less. Celebrate the New Year and a new you with Progresso Light and 100 Calorie Soups because from January 4 through March 15th, you guys can visit www.Progresso.com/SouperYou to enter the Progresso “Souper You Debut” contest for the chance to win a full makeover in New York City. We were sent a Progresso “Souper You Debut” gift pack that included 15 cans of several different varieties of the Progresso Light and 100 Calorie Soups, as well as a Progresso digital jump rope that keeps track of jumps and calories burned and a Progresso soup mug. I was very happy with the huge variety they sent. It made it easy for everyone to pick a flavor they'd like to have for lunch that day. The mug is plenty big enough and perfect for 1 can of soup! (I thought it was odd that they sent the soup frozen -slushy when it arrived, and was individually wrapped. Why do they freeze it? Stores do not keep their stock cold. I thought that was funny! So let me warn ya, the winner might be sent cold soup too) *UPDATE: I was just informed that they did not freeze the soups, they became "very cold" in shipping from the crazy weather. The winner's should not be so cold then. ONE "Mommy? I'm Hungry!" 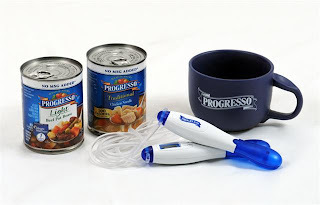 reader will win a free Progresso “Souper You Debut” gift pack that contains the mug, jump rope and two cans of Progresso Soup! 1. All you have to do is tell me what your favorite soup of all time is! 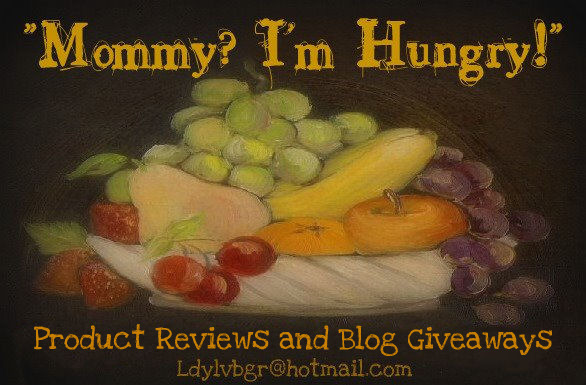 This Giveaway ends: 11:59 pm pst, Monday, January 25, 2010. I wrote this review for "Mommy? I'm Hungry!" about Progresso Soup and MyBlogSpark. The Progresso Soup, gift pack, information, and giveaway were all provided by Progresso through MyBlogSpark. I received free product to review and keep as compensation for my honest opinion of the product. All opinions for this review are that of myself & family. My alltime favorite soup is homemade chicken noodle soup although I love just about anykind of soup any time of the year. Nothing better than soup. My favorite kind of soup is Manhattan Clam Chowder. Yummy. My favorite soup ever is homeade Egg Drop Soup! Yumm!! I make it all of the time. I tweeted using your nifty button. Favorite soup ever...turkey and veggie soup! Phew, the draw is for free soup, not for the makeover... I don't WANT to be made over, I'm happy the way I am! But I'll take free soup! My favourite soup of all time is one my grandmother used to make. It involved a ham bone and white beans and totally soft spaghetti noodles, and I think there was tomato involved in the broth. I don't know the specifics, and she hasn't been up to making it for years. Toss up: Taco soup (which isn't the runny sloshy mess you get at mexican restaurants, but a hearty, bean filled almost chili like soup) and the onion soup that they serve as an appetizer at japanese hibachi grills. yum-o! following you and retweeted using your nifty button! My favorite soup is chicken and noodle. My fave soup is escarole and bean. Escarole, which is Italian Wedding Soup. WITH THE MINI MEATBALLS. No mini meatballs is a deal breaker! lol. Favorite soup? So many to choose from but I'd say it's a draw for Hot & sour soup and New England clam chowder. My favorite soup is French Onion -- any day!